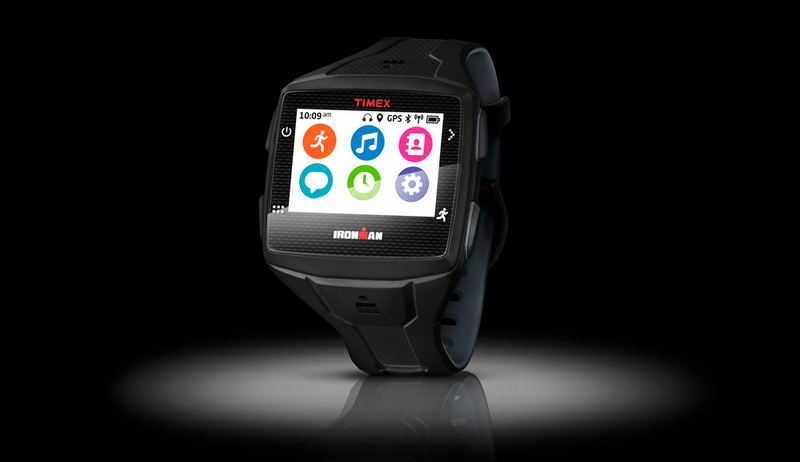 Many of the most popular smartwatches rely on a Bluetooth-paired smartphone for internet connectivity, but watchmaker Timex is taking a different tact with its first foray into the “smart peripheral” space. When it launches, the IronMan One GPS+ will be one of the few watches on the market to pack a cellular radio, along with a whole bunch of other electronic goodies. The highlight of the IronMan One is its Mirasol display. Adopting the same technology used in Qualcomm’s Toq, the watch will save battery by intelligently switching between full-color LCD and e-ink. The Toq left us extremely impressed, so we’re pleased to see another manufacturer adopting Qualcomm’s technology. The smartwatch also sports a Snapdragon processor, GPS, a Bluetooth radio, 4GB of flash storage, and a water-resistant exterior. The aforementioned cellular functions work exclusively on AT&T. Buyers get one year of service for free. In terms of software offerings, the IronMan One seems fairly bare. SMS and email is accessible via cell service, and built-in playback controls let you listen to music on a paired headset, but that’s about the extent of the features other than fitness tracking. Third-party support is, at least at launch, nonexistent – beyond routing workout data to websites like RunKeeper, Strava, and MapMyFitness, the watch won’t interact with any of your smartphone’s apps. For all the hardware, something had to be compromised. The IronMan One is huge, measuring 2 inches horizontally and vertically. Considering the purpose – fitness tracking – stylistics were probably the last consideration, but it’s a shame Timex wasn’t able to cut down on the thickness. The IronMan One GPS+ runs costly at $399. It’s available for preorder now, along with a Bluetooth heart rate monitor bundle. The watch comes in black and grey, and will arrive in brick-and-mortar stores later this year.